New Delhi: A month after India dropped the idea of an electric vehicle policy, the government’s think-tank NITI Aayog has tasked at least seven ministries with framing guidelines to encourage the use of such vehicles. Once framed, the NITI Aayog will put these guidelines together as an action plan for promoting the use of electric vehicles (EVs), four people aware of the development said, requesting anonymity. The government had earlier made a surprising U-turn on an EV policy after some carmakers protested that they were unprepared for an abrupt shift and that government policy should encourage all clean-fuel technologies. The government’s new plan suggests that it will continue to promote EVs, although it may not be in the form of a policy. “It is a welcome move from the NITI Aayog and some kind of action plan or guidelines will be enough for the industry to move ahead with electric mobility," said Suvranil Majumder, head, electric mobility project, International Finance Corp. “There has to be some synergy between certain ministries of the government when it comes to dealing with certain aspects of electric mobility." The ministries that have been asked to formulate guidelines are those of heavy industries, power, new and renewable energy, road transport and shipping and highways, earth sciences, urban affairs and information technology. While the road transport ministry has been asked to form guidelines on non-fiscal incentives, public transportation and last-mile connectivity in the context of EVs and sustainable mobility solutions, the power ministry has been tasked with framing rules for charging infrastructure. “We would have to get back to them (NITI Aayog) after a fortnight or so. 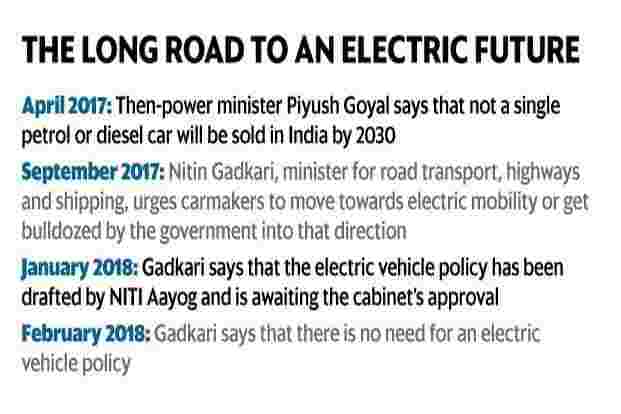 Once every ministry concerned comes up with rules in their own domain, then NITI Aayog may put it as an action plan or consolidated guideline for electric vehicles," said a senior official in one of the ministries cited above. Queries sent to a NITI Aayog spokesperson on Friday remained unanswered till press time. This will not be a policy but an action plan for promoting electric mobility in the country since the government is very serious about it, said a senior official in the ministry of power. “Every ministry will form guidelines on certain aspects of EVs under its purview. For instance, we are working on guidelines related to charging infrastructure and things related to it," said the official. The Indian government is not in favour of procuring lithium from other countries and companies will have to source lithium for battery packs by entering an arrangement with countries that have lithium and cobalt deposits. This was clarified by NITI Aayog in a meeting with industry executives in late February. “We were told that countries with reserves of lithium and cobalt may ask for incentives like free-trade agreements, which will not be beneficial for the country," an industry executive with direct knowledge of the development said, requesting anonymity. NITI Aayog will be a coordinating agency and its role will be limited to reviewing and monitoring the whole process and to working out solutions if there is an overlap between guidelines prepared by different ministries. It is still not clear whether the action plan or final set of guidelines will replace the FAME (Faster Adoption and Manufacturing of Hybrid and Electric Vehicles) scheme, which will end by 31 March.